Quilting, or patchwork, has been around for thousands of years but never as popular as it is today. With all the "meanings" and "messages" in today's quilts, they quickly become heirlooms and treasured family items. Not all quilts are exhibition pieces or works of art, but rather more practical pieces. In the old days, people used leftover material and scraps to make their quilts but today we can buy matching tones and colors to make the most elaborate of quilts. Equipment too, has been expanded and improved and could work out quite expensive when starting out. So, find an experienced store assistant who'll advise you about the essential basics to buy. Joining a quilting group is a great way to get a feel for this art - watch and learn. Initially, it might be a good idea to use old pieces of material you have at home to get a feel for quilting. If you find you like it, then that's the time to branch out and invest in some new fabrics and designs. There are many types of quilts today, made as either wall hangings, baby covers, bedspreads, "blankets", which are padded for warmth, and cushions and new rugs among many other things. Traditional quilts are hand-stitched but you can even buy quilt sewing machines enabling you to use a multitude of different stitches without having to try very hard. Learning the history of some quilt patterns and designs is interesting as they go back a very long time. Traditional quilting is a little pernickety for my liking but I am attracted to machine-stitched items. I like quilted place mats, cushions and the stained glass quilt on page 158. I don't care much for quilted clothes although I do like purses and pencil cases in a quilt style. Quilting is a huge industry supported by almost fanatical enthusiasts. Go to a quilt exhibition to see some truly magnificent works by some very talented people - it's very inspirational. 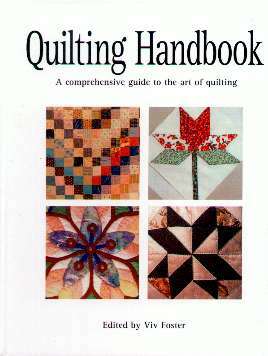 QUILTING HANDBOOK may be purchased and/or ordered through your local bookstore. Conclusion - A wonderfully creative hobby that yields spectacular results.